Welcome to my new kitchen….. Finally the saga is over. Welcome to my new kitchen! I never thought I could love a white kitchen. I love our white kitchen. After 10 years, we are finally out of “The Oak Cave”. I can’t believe this is my kitchen because I never thought I could live somewhere so pretty. Come on in…. In fact, you can see here how it’s changed even more since 2010! We’ve subway tiled our backsplash, and repainted the cabinets an even brighter white and added brass hardware! I had my grandmother’s chandelier rewired. It’s from the 1930’s. For $45 I couldn’t buy a new one! We actually decided to REMOVE some cabinets and replace them with a hutch. The cabinets we had were really inefficient and just seemed to hold crap. (Affiliate link) Our faucet is no longer made, but this is a similar one. The light fixture over the sink is a thrift store find I made over. And I do love our countertops! You can see here, how they’ve held up after 6 years! So far, they are gorgeous and easy to take care of and environmentally and health friendly! Thank you so much for your patience! I had a rough time with the lighting this morning so I hope the pictures show everything well enough, I love our new kitchen! It was quite the journey, but definitely well worth it! You can see how our kitchen looks here in 2018. Jenn!!!!!! It is fabulous! Gorgeous!!!! You must love being in your kitchen now. It is so beautiful. O-M-G!! Jen, this is out of this world fabulous!! I could not love it more, it is white, but so warm. You are one lucky girl to get to cook in that gorgeous kitchen! It’s fabulicious Jen! SO happy for you that it’s all done – and just in time for the Holidays! It’s perfect. Great job girl! OH my LANDS…girl! it is SO, SO gorgeous!!!! I love it and every detail is perfect!!!! Gee, I am in love!!! Oh my goodness! Your kitchen is gorgeous, I love it!!! It’s simply wonderful Jen. You’ve done a great job. I get overwhelmed by the thought that you painted all those cabinets. What a huge job. Can you share the paint color you used for the cabinets and why you changed you mind about the other color you had chosen? You’ve inspired me to try to do this re-do in our “oak cave”. Thanks!! I absolutely love it!!!! I’m so envious…my kitchen has the dark ugly “oak” cabinets. But…where’s the microwave??? Jen what a transformation,a nd i love love love the hutch, gives so much more character to the kitchen and I love the color of it, so perfect!!! you did a fabulous job, the floors make it so warm and cozy and it looks like you have enough space to do all your cookin!! yipee, thanks for sharing, so so so pretty!! off to share your kitchen on twitter! yeah! Wow, that is a GORGEOUS kitchen! Right out of a magazine. My very favorite part I think is that beautiful chandelier. Oh, this is BEAUTIFUL! I love it. What a beautiful space to walk into each morning! Complete perfection!!! The hutch was sooo smart and adds so much! Everything is truly incredible!!! Wow!! Stunning, I am in love with your kitchen! Very nice! love the hutch idea too! LOVE everything! It all looks SO fabulous! Congrats on the wonderful kitchen. Now it looks like it should be in an issue of Country Living. Beautiful! OH MY GOSH, your kitchen is fabulous!!! I love the hutch, it is beautiful. The details are perfect and I love your Grandmas chandy!! Beautiful! I’m sure you’re loving it. That chalk board is great. I may go find an old frame tucked away in my attic and do the same thing! Cool. I also like the dish towel holder at the sink – fantastic idea! Why didn’t I think of that? You guys did an absolutely amazing job…I’m in awe. Love it!….White is so nice in the kitchen! I have the same dish towel from Anthro. May just have to install a towel rack under my sink. I can’t believe you waited ten years for that absolutely GORGEOUS kitchen! Well done. Wow! I absolutely love it!!! Awesome job! Jennifer! It’s amazing! Love so many things the hutch, chandelier, and countertops. Did you finish them with mineral oil? I would love to do the same! Gorgeous! I love the soft white against the dark floors. The hutch is fabuloso!!! I want to put on my softest socks so that I can slide across the kitchen floor to stand under the amazing chandelier just smiling and taking it in! Oh, and GREAT JOB Klaske construction!!! I love what you did with your kitchen. I will be remodeling mine after the Holidays, and I can not wait. Also going from oak to white. I love, love, love the addition of the hutch. Outstanding! LOVE LOVE LOVE!!!!! Sooo Cute! Beautiful!! My dream is to one day have a white kitchen. I love where you put your dish towel…this is always a problem…where to hang the dish towel! I hate having to hang my dish cloths on the oven door handle. Love the glass cupboard as well. BEEEE U TEEE FUL, Jen!! Wow !!! Gorgeous and so inspiring! it is absolutely fabulous!! congratulations, i’m SO happy for you! beautiful! I love my white kitchen too! Your kitchen is absolutely amazing! The counter tops are to die for and so is your hutch makeover,you must be so pleased. Head on over to my place I’m having a giveaway! Hi Jen!!! I am new to blogging and JUST found you!!! Im CRAAAAZY about your site! The kitchen redo…A-MAZ-ING!!! Aaahh, SWOON! I have an interior design business and blog…im doing 14 days of christmas trees and would BEYOND LOVE if you would come visit me! PLUS i have a GREAT GIVEAWAY TOO! ooooh! It is SOOOOO gorgeous! Way to go, girl! I’m sure you are so happy it’s done! IT is absolutely lovely! Wow. I am in awe. Just beautiful! Love the chandelier. And the hutch is the perfect addition. It was worth the wait! Absolutely perfecto Jen! Love love love it! And being that I am going thru a remodel right now, I can totally understand the feeling of accomplishment that you must have – I cant wait to be there too! Jen, the kitchen is beautiful, LOVE IT. Although I think you had some wonderful cupboards to work with, love the little ones on top. and that hutch!!! Well done! Your kitchen remodel is absolutely fabulous! I love the hutch, the wood countertops (we have wood, too! ), and overall effect. You’re going to love this kitchen for many years to come, girlfriend. Thanks for putting us out of our collective misery by sharing photos. I’ve been dying to see what you did! I wasn’t disappointed. I don’t usually comment, but WOW your kitchen is stunning! I love the color of floors you picked especially. It’s the perfect hue of not too dark and not too light. Lovely! You should be so proud of yourself, that kitchen is gorgeous and I love the hutch!!!! Oh my goodess!!!!! I am drooling! This is absolutely extraordinary! I am completely and utterly jealous! Hi Jen, Your kitchen is absolutely gorgeous!! What a fantastic transformation and I am in love with your hutch. I can’t begin to tell you how much I love your new kitchen. Absolutely breathtaking!! I never thought I would go back to liking a white kitchen either, but these pics definitely have convinced me it’s still gorgeous!! so beautiful!!! I love every detail. I have a feeling when we finaly sell our house in TN and buy a new one here in NC I will be redoing lots of things. I will use your kitchen as inspiration FOR SURE!!! just lovely! good job!! your kitchen TOTALLY ROCKS!!!! i love everything about it! Beautiful!! You have done an awesome job! What a great idea to remove the cabinets and add the hutch! And your grandmom’s chandy is beautiful! That is so incredibly beautiful! What a transformation. Your styling is perfection. Thanks for the eye candy! It’s gorgeous!! I love it. I especially love that you just rewired your grandmothers chandelier. It’s effient and so sentimental. So fresh and pretty and just plain perfect!!! oh, and did I say pretty?!! Your white kitchen is divine! I love white kitchens….just painted our 1920’s kitchen white. Sooo pretty! I love the hutch. I love the chandelier. I love everything! You did an awesome job! Oh, Jen – it’s just beautiful! I love it! You did a great job. The chandelier is perfect and I love that it was your grandma’s and the hutch is amazing!! Congratulations! wow, it doesn’t even look like the same kitchen! I love your kitchen, and the idea of replacing cabinets with a hutch is just genius. What a great space to spend time with friends and family…enjoy! Beautiful! It is so much lighter and brighter and just lovely. I love that you tore out some cabinets and replaced them with the fabulous hutch you painted. All your hard work was worth it! You must be one happy smiling girl having such a beautiful kitchen. What a great transformation. I bet it is hard to leave the room – I would want to keep taking it all in. Perfect timing to have it complete – just in time for the hoildays. Just beautiful! I , too, “escaped” an oak cave and found solace in a white kitchen!!!! Love it and yours, great work! I’m dreaming of a white kitchen. . .It’s absolutely gorgeous. LOVE! It turned out amazing. Great job! LOVE LOVE your new kitchen! That is so gorgeous , I have those same corbels you have installed at the ceiling , cute . Oh, it’s really lovely! I’m so happy for you. Your pictures are just great and so…is that HUTCH! Oh man, that was worth the wait! IT’S FABULOUS!!! You are a true talent, and I LOVE everything, especially the hutch. Gorgeous! Sooooooo beautiful, spacious, and decorated perfectly! I love it!! We redecorated ours too recently and I’m so glad to have our old wall paper gone and bright colors on our walls. We went with a lighter color on our cupboards too! It’s really beautiful!! The decision to use the hutch was genius! It is GORGEOUS!! Loooove it!! oops! just had to come back and say how awesome it all looks Jenn! WOW WOW WOW! How have I not seen your blog before? Your kitchen makeover is fabulous! It’s amazing what paint can do! I love that you have your grandmothers chandi in there, so special. 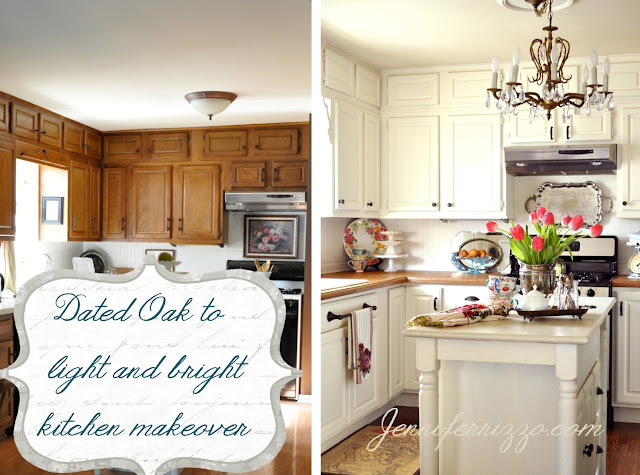 We repainted our oak cabinets as well, such a difference. All I can say is ABSOLUTELY BEAUTIFUL!!!!!! Gorgeous!! What a make-over!! You are so very talented and have great vision! It looks fabulous! Wow you did an amazing job! Okay, Jenn I love your new kitchen so much, I had just had to come over and look at your pictures AGAIN LOL!!! It’s fabulous!! What a wonderful change! It is fabulous! So light and airy! Great job! It turned out beautifully and I love the way you accessorized it. Great job and worth the wait, I’m sure! Ohh WoW Jennifer, your kitchen is so BEAUTIFUL!!!!! This is such a Awesome transformation, and how perfect that it is finished right in time for the holidays!!!!! I just know you are so going to enjoy cooking in that Beauty!!!! Enjoy, and thanks for sharing…. Love it, Love it!!!! This kitchen is inspired! I need to do the same thing, except my cabs are maple. I love how you took out some cabs and put in a hutch instead in a painted finish. Love the bead board backsplash and the wood counters!! Following you now! It turned out so beautifully Jen. Oh it makes me wish I had gone for white in the kitchen. All of it is just ‘right’! What an amazing job! It is just stunning! 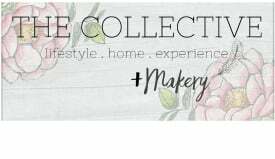 I am your newest follower and can’t wait to explore your blog! WOW!!!! It looks so beautiful!!! I love everything. White kitchens are my favorite, for sure. I am in love with the counter tops and the hutch. I can’t wait to hear all the details. I am In LOVE with your new kitchen. It’s just perfect! I’m in the process of a small remodel to my 1940’s kitchen and I would love to add a little island like you’ve got. Can you tell me the width of your kitchen? I can’t quite tell the size in comparison to mine. Thank you so much, your kitchen is beautiful! I’m in the process of redoing my 1940’s kitchen and I would love to add a little island like you’ve got. Can you tell me the width of your kitchen? I can’t quite tell the size in comparison to mine. Thank you so much, your kitchen is beautiful! How absolutely fabulous! Magazine ready for sure! I love the paint colors…what did you use? Now this is one BEAUTIFUL white kitchen…love that hutch!!!! BEAUTIFUL kitchen!! Love how fresh and pretty it is and the hutch is gorgeous, the perfect addition. Does the chandelier give you a lot more light? Your kitchen is just gorgeous!! OH! MY! GOSH! It is utterly devine. I just finished a (white) kitchen remodel and I so wanted wood countertops but I was afraid…terribly afraid of the upkeep and if they would really hold up. 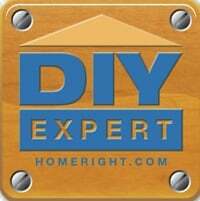 Hope you plan to extensively expound on the countertops when you give the run down on your kitchen’s details. I could seriously be tempted to rip out my new LG acrylic countertops for wood after seeing yours. I am so in love! The hutch and chandelier are pretty darn awesome too. Beautiful job! Enjoy! How do you keep the germs out of the wooden counters? Who made them? I’ve seen them in Ikea for sale!!! Jen…this turned out FABULOUS!!!! How beautiful, serene and classic…love it all!! That hutch is gorgeous and what a great deal on your chandelier, so pretty! I am sure you will enjoy your new kitchen so much…you probably don’t want to go out of it. Just in time for Thanksgiving…enjoy and Happy Thanksgiving to you!! I’m so sorry I’ve been MIA – I have just been reading long-overdue posts – and I am completely taken back by your kitchen!!! I am so excited for you and have saved some of them in my ‘dream decorating’ folder. I’m not surprised – your eye is FABULOUS – it is seriously night & day different than before, isn’t it!? Love it – so excited for you that it is all over – perfect timing! I finally had a chance to stroll through your new kitchen. It is truly a work of art! It has such an elegant and welcoming beauty. You have to be so proud of what you did. You turned a nice ordinary kitchen into something so EXTRAORDINARY…what a fit you have. So happy to be your follower.. I Heart it. Do u know the paint clor and brand they used on the cabinets? Beautiful kitchen! Did you paint the cabinets? I’m currently painting my kitchen cabinets. I almost went with white, but ended up using a steely green grey. Thanks so much for sharing. It turned out so perfect! It looks exactly like my kitchen…the one in my dreams! I especially love the chandelier and the hutch. I give your kitchen a 10+++++++++++++++++++++++++!!! Great job!! What a gorgeous kitchen! I love the creamy white cabinets with the wood countertops. It is so bright and lovely! Jennifer – I just discovered your blog via Morning T. I am SO glad I did! I agree with her statement that she has a “blog crush”! I think I do now, too! lol! After totally drooling over your kitchen redo – I can now visualize what my “oak cave” would look like if I could ever convince hubby to let me paint it. *sigh*…..a girl can only hope…..
So.completely.gorgeous. I am speechless! Fabulous. WOW! I just found your blog and love the looks of your “new” kitchen! I painted our cabinets white earlier this year and am still so beyond happy with how it transformed our kitchen! Lovely tour – beautiful kitchen! I linked it to my “kitchen remodels done white” post too! Wow – just came over from Velvet & Linen. What a beautiful kitchen! I love how you styled it too, with the touches of green bringing out the white of the cabinets and the warmth of the wood. Love the hutch too – what a great touch! I am decluttering my house in preparation for listing it for sale, and it is amazing how much ‘stuff’ I keep in my cabinets – I truly only use two of my cabinets. I use the drawers and storage under the cabinets much more. Love the song that’s playing as background. Who’s the artisit? I am really really considering butcher block for my home. I have a question for you? Which butcher block did you get from Ikea? The numerar in oak? Also, How did you get the nice edge on them? Did you have someone come in with a router and route the edges? Now, that it’s been a while, How are they holding up? Has it been easy to sand out any nicks or stains? Oh how I DREAM of a white kitchen. You did an amazing job with the white renovation. I am going through a “white” phase right now too. Room by room, I am working to lighten and brighten. Hi, could you tell us where you found your light above the sink?? Thanks! OK I know that this was done last year but I just bought a new house and your kitchen island came to mind when I saw my new kitchen!! Was it a table and you put in a cabinet below it?? If you could share some details on your island I would be BEYOND Delighted!! Hello! – Where did you get your towel bar in front of your sink? I love that! Hi Amie, we made the island from a tall table and a stand alone bathroom cabinet. Stunning transformation, I love your style! Would love to cook in this kitchen it is so light and bright. Our cabinets are just about the same as the before shots, been thinking of painting ours as well. Great inspiration. I am IN LOVE with your kitchen! Brilliant makeover! You have got to be thrilled with the results! I love this new cabinet makeover! I am always looking for something new to place on the counter too, recently I found this tuscan home decor jar that would look great under cabinets! OMG…I WAS JUST CHECKING OUT 24 Amazing Kitchen Makeovers ON COUNTRY LIVING AND YOUR KITCHEN WAS ON THERE!! SO COOL THAT I KNEW IT WAS YOUR KITCHEN AS SOON AS I SAW IT!! LOL JUST WANTED TO SHARE!! What color did you use to paint that fabulous ‘green-ish’ cabinet you used to replace the oak cabinets?!? It’s beautiful! !